Aung San Suu Kyi spent more than 15 years in detention. She was released from her third period of detention on 13th November 2010. View images of Aung San Suu Kyi in the photo gallery here. 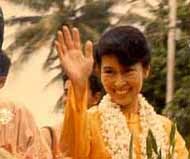 Aung San Suu Kyi was released on 13 November 2010 after spending more than 15 years in detention, most of it under house arrest. The international community should use the release of Aung San Suu Kyi as an opportunity to apply pressure on the dictatorship to enter into genuine dialogue. This briefing provides recommendations for action from the international community.